The Bf-109H is actually a high altitude development of the Bf-109F series. Work on this plane got underway in early 1943. The initial prototype, Bf-109H v1 was made by inserting a 2 meter wing section and bracing the tail plane. This aircraft was destroyed in 1944 by a bombing raid at the Daimler-Benz factory where it was undergoing engine trials. A small batch of Bf-109H-0 pre-production aircraft was followed by an equally small production run of Bf-109H-1 fighters. These aircraft were powered by a 1,300 hp DB601E and was armed with two MG 17 machine guns and a single 30mm MK 108 cannon, all in the nose. The aircraft was capable of attaining an absolute altitude of 44,000 feet; no mean accomplishment in those days. Though several other developments were proposed, including a dedicated reconnaissance version and a heavily armed fighter, none were built. A few aircraft were delivered to a Channel coast reconnaissance unit, 3. (F)/121, based at Bernay in April of 1944. However, in all my years of reading and research, I have never seen a single picture of a Bf-109H. Little is really known about this elusive aircraft. The instruction sheet for this kit mentions an armament of 3 20mm cannon in addition to the two MG 17s. 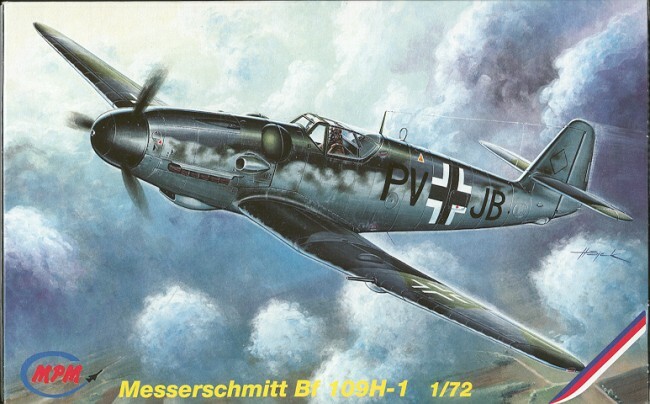 It also states that the prototypes were Bf-109v54 and v55 and were fitted with DB605 engines, which differs from the material mentioned in the reference. Any additional information on this interesting aircraft would be appreciated along with references. This is another of MPM's 'Upgraded' kits. What that means is that you get the addition of resin parts to the model. This is also one of MPMs older kits and you can tell that by the thickness of the sprue gates. A razor saw is recommended for removing all the parts. The light grey plastic is nicely done with fine engraved lines. The plastic itself has a rather rough texture, undoubtedly due to very minor pitting of the molds, however, a light sanding should take care of that roughness. The parts also have a bit of flash on them, which is expected from short run kits as well as large ejector pin stubs in the fuselage, wing and wing center section. These can also be easily removed and sanded smooth. 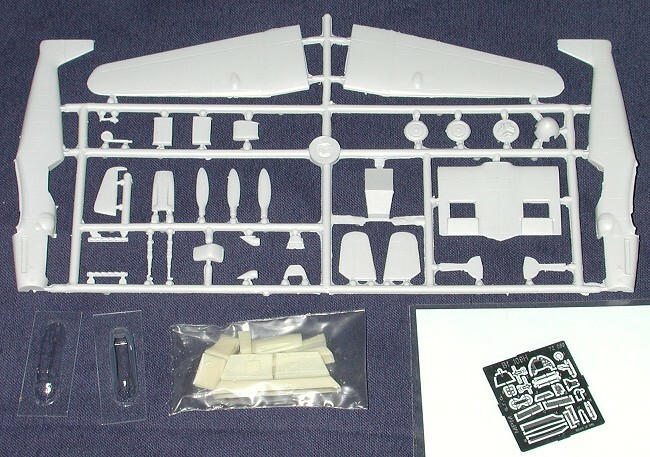 The resin parts consist of the interior and sidewall detail, landing gear doors and the upper fuselage gun troughs. There is an etched fret that includes instrument panels, trim wheels, seat belts, rudder pedals, df loop, radiator screens, oleo scissors and exhaust shields. There are two vacuform canopies, one 'normal' and one Erla Haube as used on late war 109s. The instructions are quite good and show 8 detailed construction steps. Color callouts are given in each step as needed, with paints corresponding to Humbrol colors. There is also an addendum sheet to cover the Upgrade resin bits. This sheet also gives RLM colors. They suggest you paint much of the interior RLM 02 Grey, when by that time, all cockpits were to be painted in overall RLM 66 dark grey. 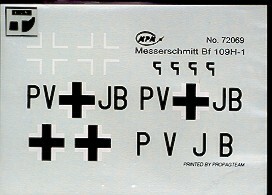 Decals are by Propagteam and are for two aircraft. One is the prototype Bf-109v54 in RLM 74/75 uppers and RLM 76 lowers. The other is a generic Bf-109H-1 in the same colors. Frankly, before building this model, I would recommend doing more research into the type. With such conflicting information from two sources about the aircraft, it is difficult to decide exactly what the plane looked like and it is probable that what is given in the kit in reference to equipment and markings may not be totally accurate. However, the kit itself does not look to be that difficult to build, and anyone with experience doing short run kits should be able to produce a very nice model.